There’s a great forum discussion on Boatmad about the famous Chasewater 24 Hour race in 1968. This image from that thread is of Peter Unwin’s team and prizes won on the day. Click on the image to visit the discussion. The aerial image of Chasewater I posted on Thursday evening really has spurred on some creative consideration of the park’s history. I’ve been surprised and delighted by the memories and theories that have emerged relating to the stunning image, taken in June, 1963. I don’t think we’re any closer to identifying a specific event that was taking place, but local historian Clive Roberts from up The Wood has found some interesting material about the speedboat racing, which features at the bottom of this post. From the Lichfield Mercury, May 1899. I think this helps nail a myth. Readers of the long-in-the-tooth variety will remember, no doubt, the ongoing myth of the paddle-steamer that once operated on the lake. Several times in pubs locally over the years, I’ve listened with wry amusement to some raconteur who can recall it; it was the myth that refused to die. When Chasewater was drained, many folk idly speculated as to whether the wreck of the boat – which in the legend, always sank – would be revealed. Not quite the wrecked paddle steamer many were expecting, but a remarkable find. Image posted on Flickr, by JanCruick. May 1899: Chasetown Temperence Brass Band give sacred concert at Norton Pool Dam, the weather was cold but 700 to 800 were present. (In 1900 there were an estimated 2000 there). August 1899: Boat race, in front of large gathering, starting from the steamboat landing stage to the dam on the N side and back, a distance of 3 miles. First was Handcock and Boonham in a time of 55 minutes. July 1901: Midland Sailing Club first Annual Regatta (they had a corrugated iron building on the north shore, around where the sailing club is now). Also after a fatality during the bathing season, it was suggested that a special area be set aside, and swimming barred from the rest of the Pool. November 1901: Chasetown Fishing Club contest on Monday afternoon, but a strong gale blew and the contest was abandoned. February 1902: Considerably over 1000 people could be seen on the large sheet of ice covering Norton Pool on Sunday, many travelling by train to enjoy the skating. A football match was played. Some indulged in ‘scorching’ on bicycles. (And again in the winters of 1903/4/5). July 1903: It is rare that the water on Norton Pool is quite calm. The advent of the motor car will make the place less difficult to access, and the accommodation of the Sailing Club pavilion enables visitors and members to pass their time in comfort. November 1903…The gale on Saturday raged the whole day, happily there was no loss of life. Norton Pool presented an unusual sight as waves dashed over the dam. January 1911: Brownhills Urban District Council recommend the canal company should be advised to lower the overflow weir at Norton Pool to prevent flooding. June 1911: Accident by a pony and trap moving along the dam caused two injuries. Between 1899 and 1916, on average, there may have been one fatality a year in Norton Pool. There was shooting and hunting around the perimeter, with quite a few foxes being lost! Local history ferret [Howmuch?] picked up on an interesting one about Chasewater the other day: he’s been told that during the Second World War, chains or ropes were laid over the pool, binding long series of wooden railway sleepers, as a floating barrage. The idea was, apparently, to stop ‘Flying Boats’ landing on the water. I have a number of problems with the above, not least of which being the fact that railway sleepers don’t float. Does anyone know if this new myth has any basis in truth? Has anyone else even heard it? This isn’t the only wartime myth about Chasewater: another suggests that bombers returning from raids would dump excess ordnance on Chasewater on the way back from Germany. Plainly specious, this one still persists. Whilst practice raids were held on Cannock Chase, only a complete idiot would return with undropped bombs (it took extra fuel to carry them, and fuel was tight in those planes), and secondly, risk blowing up the dam? Really? 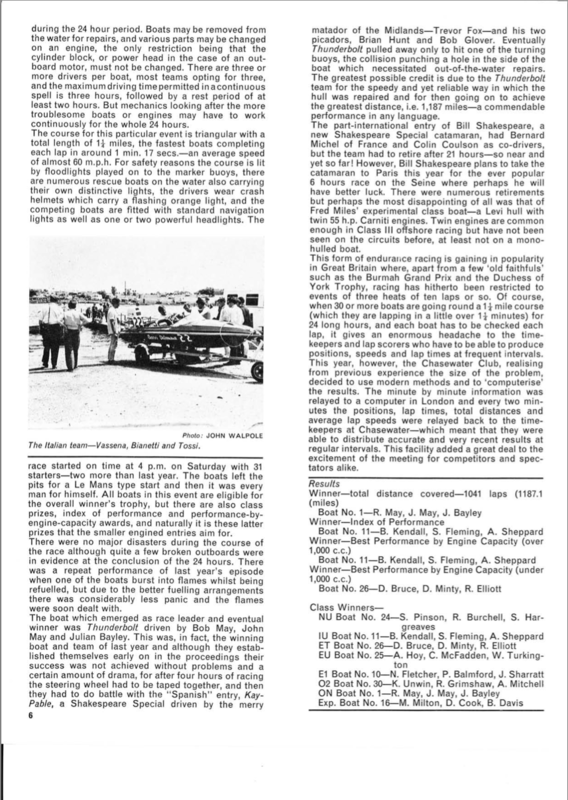 Clive Roberts found the wonderful article below online in Graham Stevens wonderful site, The Powerboat Archives. This contains a whole host of articles about such events held at Chasewater over the years. I’ve checked 1963, and it has an item covering May, but not June. There’s a wealth of stuff there worth a look. It seems that the famous 24 hour race in 1968 attracted the attention of royalty. In relation to that race, there was also a Go-Kart event on at the equally famous track on Chasewater’s south shore (the track was, of course, lost under the M6 Toll). It’s worth popping over to Karting Magazine’s archive to check out the report: competing, and winning, was one N. Mansell. Yes, that N. Mansell, who graduated later to driving altogether faster vehicles. Fellow Brownhills history wonk David Hodgkinson mentions it on his site. 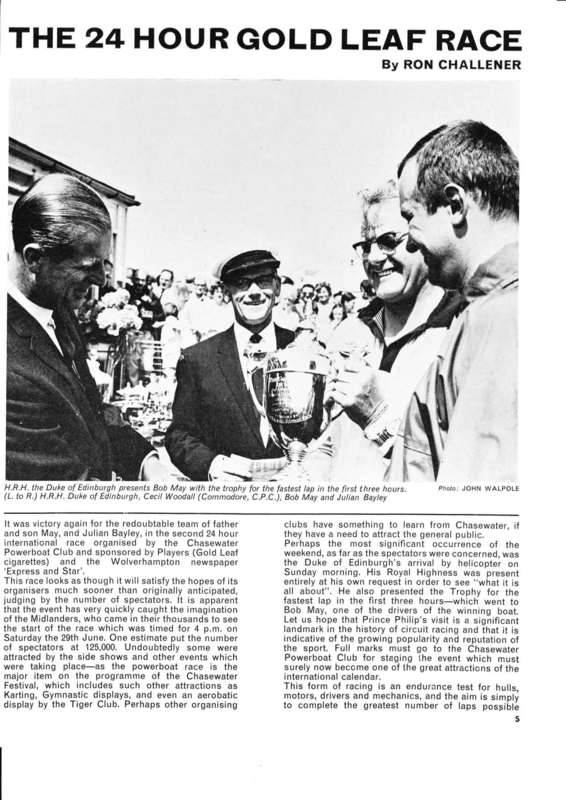 1968 magazine article about the 1968 24 hour speedboat race at Chasewater, found in Graham Stevens Powerboat Archives by Clive Roberts. Click for a large version. This entry was posted in Brownhills stuff, Cannock Chase, Chasewater, Environment, Events, Followups, Fun stuff to see and do, Interesting photos, Local Blogs, Local History, Local media, News, Reader enquiries, Shared media, Shared memories, Social Media, Spotted whilst browsing the web, Walsall community, Wildlife and tagged 24 hour race, Brownhills, Brownhills local history, Chasewater, Chasewater Dam, Events, J Donaldson, local blogs, Local History, New Photos, Nigel Mansell, Norton Pool, Redevelopment, Reservoir, Silly, speedboat, Staffordshire, steamboat, Wildlife. Bookmark the permalink. a big thank you to Clive, please. There is also the story, passed on from the family who lived in Hghfields Farm, that a coach and horses rode over the frozen lake one winter.many years ago..
Chasewater in WW2..Perhaps in Aldridge history booklet..something about the lake being covered to prevent enemy bombers using its nighttime reflection as a waypoint /marker en route to Liverpool etc..also perhaps Birmingham overshoot bomb drop..when misinformation via BBC news to deceive actual target hits resulting in radio directions being re-set? One of brickworks very tall chimneys at Aldridge demolished to confuse…Can readers help clarify, please. Can we consider this for a minute? I’m really interested in the stuff, and also the way people seem to uncritically accept odd stories of stuff like this in wartime. I’d like to assemble the local ones. I was told that Wiiton Cemetery, in Birmingham, had two churches, one of which was taken down so that the Germans could not line up the Kynoch Works. I have found no evidence yet! the website “StuartWilliams.net” which I read in April 2011 and referred to in your article around then, was where I think mention was made of Chasewater, in Jack Haddocks notes “the Battle for Walsall”. The other reference, also quoted in my comments in earlier articles,is as follows; Jan farrow’s book, Aldridge in Old Photographs, ISBN 0862999723, published 1991, which mentions the chimney stack in Aldridge,and, I think, shows a photograph. Perhaps readers might like to read these. minute 411. An application was received from the Commander of the Midland Air Division of the R.N.V.R for permission for the Division to have facilities on Chasewater for a Whaler and two Dinghies for instruction on sailing and boat pulling. It was decided that permission be granted subject to the payment of £3 per boat. I remember the 24hr race well. Married on the 22nd June and got caught up in the Carnival Procession, 20 minutes late arriving at the church. Went away for a week to return to our maisonette in Breeze Avenue in Norton Canes not knowing anything about the race, hot night bedroom windows open and the noise of the Power Boats. We went away the following year.